It’s my belief that the effects of World War II have been vastly underrated, that the war was a great collective trauma felt the world over, and that while its political consequences are well-chronicled, the psychological damage it inflicted both on the people who fought it, the civilians who suffered through it and the children born during it or in its wake are as varied and vast as they are unexplored. I see the war not just in the dark crime melodramas of Hollywood’s film noir phase, but in the quiet family sagas of Yasujiro Ozu and in the warriors desperately trying to live by a code while professing apathy in film worlds as diverse as Anthony Mann’s West, Akira Kurosawa’s Tokugawa period and the Shaw Brothers’ jianghu. I see it in the kill your idols disillusionment of cinematic New Waves all over the world, and in the radical idealism of the next generation’s belief in the power of mass social protest. The war is the key that unlocks and explains the latter half of the 20th Century. Wong Kar-wai’s second feature is, I think, one of the great films about the post-war generation and the lingering effects the war had on their psyches, their visions of the world. Set in 1960, the main characters would have all been born in the mid to late 30s, during China’s war with Japan, and likely brought to Hong Kong sometime during the war or the immediate post-war period, during the civil war between Communists and Nationalists. (During the war, the colony’s population shrank from 1.6 million in 1941, to 600,000 in 1945, then rapidly ballooned well past its prior size with an influx of refugees fleeing the Communists on the mainland in the late 40s and early 50s.) This history is inferred, we’re only given sketchy details of two character’s backgrounds: Maggie Cheung appears to be the most recent arrival, coming from Macao, another cosmopolitan European colony a few miles down the coast while Leslie Cheung’s birth mother now lives in The Philippines, though it’s unclear if he was adopted from there and brought to Hong Kong, or if she fled Hong Kong for there, or if there were other cities in-between. The details aren’t really relevant: it’s the sense of massive social upheaval, both geographical and political and personal that gives the film its rootless, restless quality. The characters are all haunted by this unexpressed past, their obsessions born out of a gap in their lives they can’t quite seem to fill. For most of them this takes the form of an unrequited romantic longing: Maggie wants Leslie, Andy Lau wants Maggie, Jacky Cheung wants Carina Lau, Carina wants Leslie. None of them end up together, but by the end of the film, they all (but one) seem better off for the experience of having loved and lost, ready to take on new adventures. 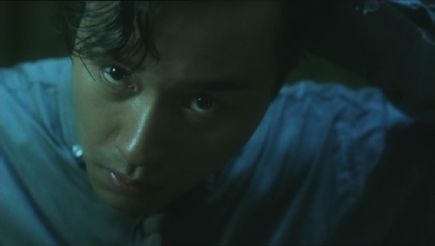 Leslie Cheung is the tragic case, for he remains trapped in the present, unable to imagine a future without filling that hole in his past, which for him means confronting the mother that abandoned him. Without a past, he can have no future. Without imagination, without hope, without a home or a family, his myopic nihilism can only end in self-destruction. Time dominates the film: clocks are everywhere, yet everyone is always asking what time it is. Moments out of time stand as memories, as correlatives for love itself (as in the single minute that Maggie and Leslie share that will haunt her to distraction while he can’t quite manage to forget it). It’s the ability to experience memory as memory, rather than a constant happening sadness that enables the other characters come of age, move on and take action to reinvent themselves, but Cheung is incapable of this kind of self-creation. Trauma leads to stasis, and stasis leads to death. The young are like sharks, they have to be perpetually in motion. But Leslie simply can’t move forward, the hole in his past is too big to lock away, to cope with, to turn into a thing he once experienced and felt and, via the peculiar alchemy of nostalgia, learn to miss, to make bittersweet. He can only linger on the periphery of the present until he simply fades away, to exist only in the memories of the few people he knew for awhile during a green and rainy year when they were young. 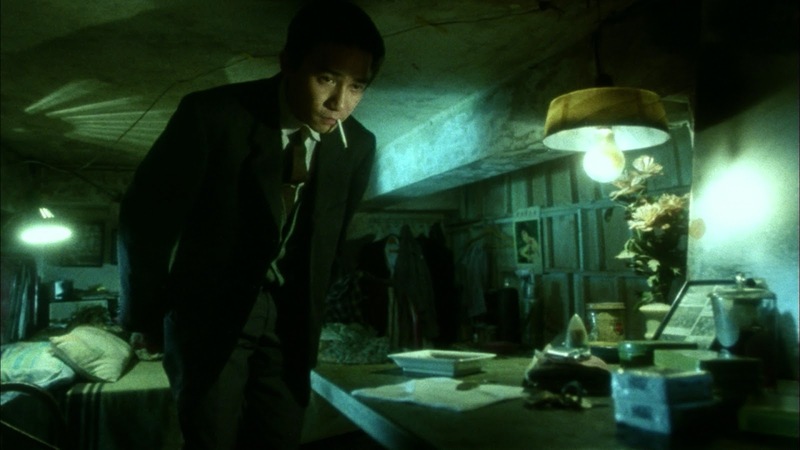 And then he is gloriously reborn as Tony Leung, a dapper young man prepping for a night on the town, his movements smooth and musical, a tiny man in an even tinier apartment, stacked to its ridiculously low ceiling with style and panache. We will pick up his story a few years later, as he meets Maggie Cheung and learns that being a middle-aged man stuck in the past is far more profoundly sad than being a young man stuck in the present, but nonetheless a whole lot better, for even in sadness one can imagine a future, even if it’s a future populated only by people and robots who find themselves locked in their own memories.